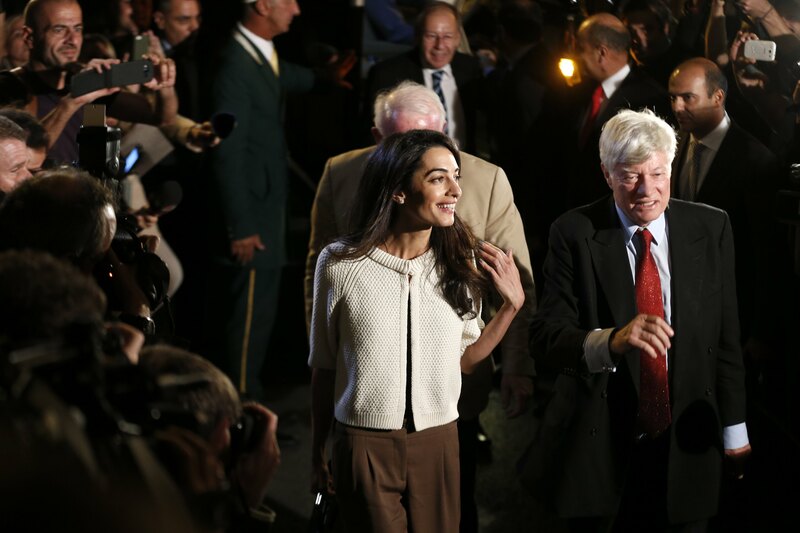 Amal Alamuddin Clooney arrived at the Hotel in Athens 13.10.2014 – First pics ! 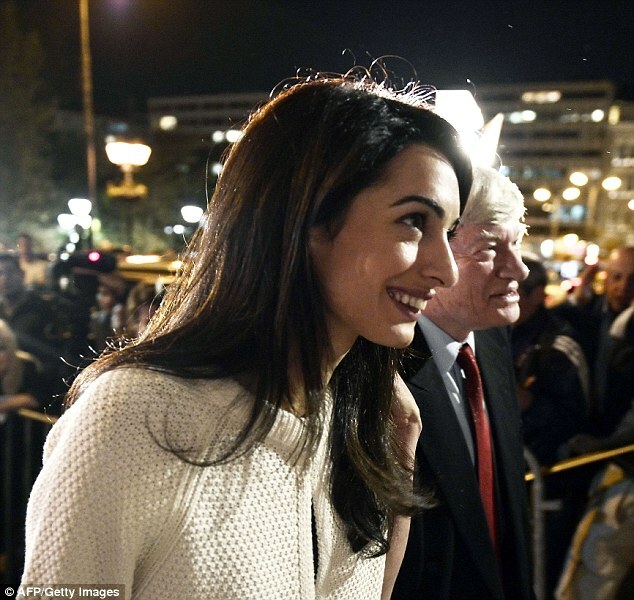 On Monday night Amal Alamuddin finally arrived in Athens . The journalists were waiting at the airport Eleftherios Venizelos hotel Grande Bretagne, where she is expected to stay until 16 October. 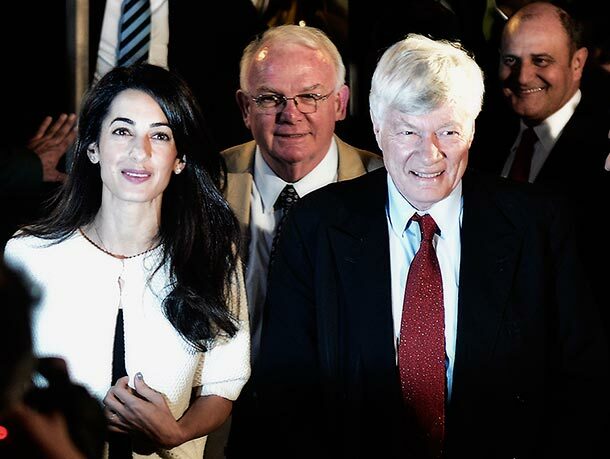 “I’m very glad and honored by this invitation, thank you,” Amal Alamuddin Clooney told to the reporters. 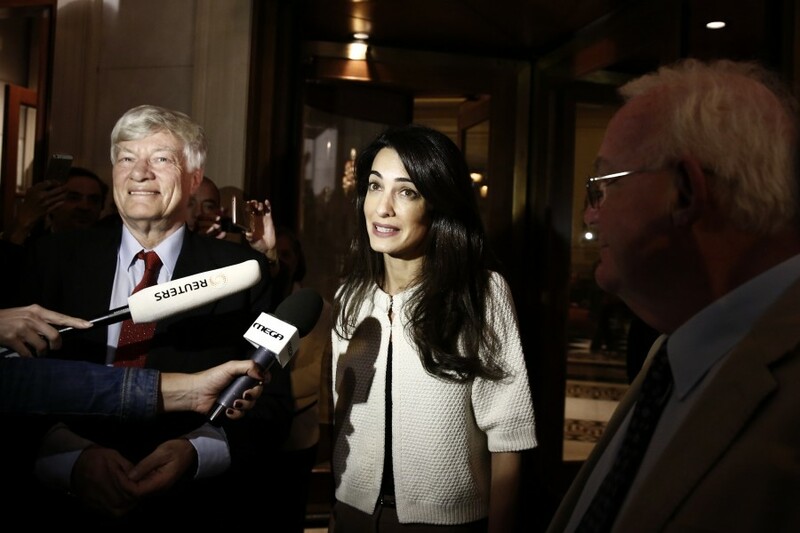 Amal Alamuddin Clooney will provide legal advice to the Greek government for the return of the Parthenon Marbles . . According to the newspaper Espresso, a meeting is expected with the Minister of Culture and Tourism Constantine Tasoula. As the report, the Minister would donate a symbolic object of historical content of the Archaeological Resources Fund Receipts. 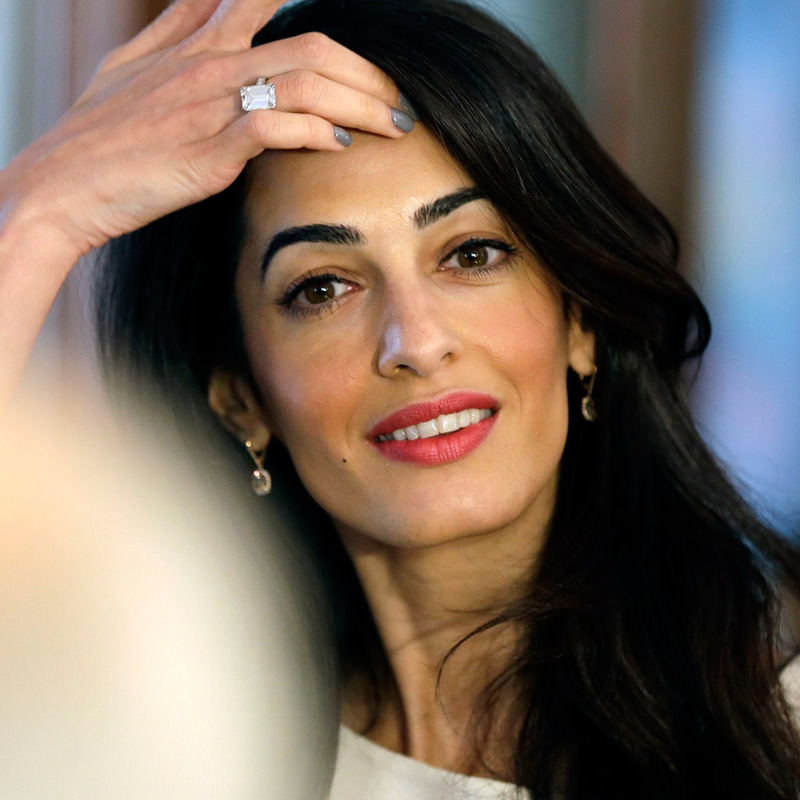 On Wednesday, Amal Alamuddin will meet Antonis Samaras and then will visit the Acropolis Museum.. On the same day an interview is schedulded with the journalists, while the visit will end with a lunch at the museum restaurant. The 36-year-old human rights lawyer arrived in the Greek capital, Athens, with archaelogist David Hill and barrister Geoffrey Robertson, to meet with the Greek Prime Minister Antonis Samaras and culture officials. Amal wore an ivory cardigan, with brown pants and pointed pumps. Theres something about her that reminds me of Jackie O. I love how she holds herself, confident, classy and she seems genuine, real. I am curious , as to just how tall is she ? She is always in heels, my. Guess is around 5-7….? I really like your blog. And she’s really cute and photogenic,….. but when I see all these photographers and paparazzi at such an event, that otherwise surely would not be there, I still want her to be regarded more as an expert in her professional field and not just as a new media starlet. It would have been nice to recognize that we women are much more than pretty clothes hangers. Impressive! Very professional woman and I like how she handles herself with all this publicity. On fashion, I like her style. Can’t help but think it’s too bad that Duchess Kate doesn’t dress like this. And what I mean is looser clothing. Amal dresses very professionally, whereas Kate has had some very questionable moments. (too much leg, neckline too low, too tight jeans, inappropriate shoes for the venue, and the worst – the flashing incidents.). I think her name is perfect as is. Ok if she wants to add Clooney as double last name, but she shouldn’t drop Alamuddin. I bothers me that successful women still face the pressure to carry the husband’s name. Anyway, I think she’s amazing and hope she continues her career and is respected as Amal Alamuddin first and foremost! She’s not changing her last name under any pressure, but because it is advantageous to her career to be known as “Mrs. Clooney,” as it brings her publicity for the cases that she is working on. In some sense, I feel that she has cheapened her professional credibility by taking Clooney as her last name, but that’s her decision to make. She gains a lot, professionally, with the massive publicity that she has gotten from this marriage, as it elevates her name internationally to one that is known by many. This is also one reason why she is not camera shy and all of the photos released of her have been very carefully managed. I am a newbie here. I just wanted to say how much I enjoy your site. I am intrigued with Mrs. Clooney, she is the ultimate in both beauty and brains , a somewhat rare combination these days when you factor in her style. I enjoy the photos and articles, as it helps in these personal times of crisis,.they serve as a pleasant dreamy distraction. Keep up the great work, again, thank you !